Some folks just have a way with words and Gary's words are as good as they get. This poem is based on an actual story. And he spoke to the man he’d patched up. How old are you, sir, and how did this happen? Seventy-three, came the answer; a little bad luck. Scattered ’cross the rich winter meadows of home. And horses, so they’d dropped him to sulk all alone. So now came the hand and his partner to find him. Sometimes bulls cool off and come in on their own. But this one had sulled up and staked him a homestead. He was hungry and dry and bull-mad to the bone. And hooked and thrown dust and took on the world. It looked like he’d stay till the buzzards dined on him. Just a lump of tough meat -- his battle flag cased and furled. Once moving, the bull might move down to the tanks. And save his damn life, not expecting his thanks. Who came up on the run with blood in his eye. The hand jerked his hat down and took off for the pickup. And as he went he was wishing he’d learned how to fly. The ground shook behind him, it was judgment day. Parked 50 yards and 50 years way too far away. As if the hammered body still owed a debt to pay. As the partner of the hand charged headlong into the fray. The bull could not match courage with the forces that he faced. And a desperate call brought help at a life-saving pace. And he said, why do you stay with me, year after year? This sure is not the first time this life has almost killed you. She gazed into his eyes and smiled, yes, but we’re still here. with the barbed wire ticklin’ your chin? and said all those cowboy words again! you don’t want company on that kinda’ day. you can get famous in all the wrong ways. to close the gate again before you can ride. that can parade through an unclosed gate. to lengthy rides into neighboring states. one day figured up a trick deal. the gent who invented the wheel. right under the top loop of wire. then you’ve got the slack you require. than me, but I got that wire looped. use yer’ rope and just add some more brute! Cautions...For you all that might want to really try this trick, here are a couple of pointers! You can unthread your rope for a tall post. And one rider can stand his horse right beside the gate if necessary. That is, however, a little risky if your horse ain't rock-solid. 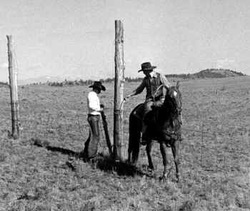 In fact, you should only do this at your own risk and with a horse well-broke to pulling a rope in unusual circumstances.